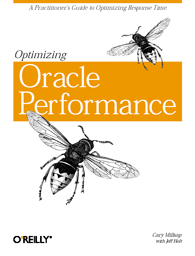 The first product I ever created after leaving Oracle Corporation in 1999 was a 3-day course about optimizing Oracle performance. And now, the actual OTN interview (9:11) is online. Thank you, Justin; it was a lot of fun. And thank you to Oracle Corporation for another great show. It's an ever-growing world we work in, and I'm thrilled to be a part of it. Today we installed two new blogs over at our method-r.com web page. We created them to give us—all of us at Method R—a place to talk about our products and professional experiences. I hope you'll come have a look. I'll still be posting here, too. For the past several weeks, my team at Method R have been working hard on a new software tool that we released today. It is an extension for Oracle SQL Developer called Method R Trace. We call it MR Trace for short. MR Trace is for SQL and PL/SQL developers who care about performance. Every time you execute code from a SQL Developer worksheet, MR Trace automatically copies a carefully scoped trace file to your SQL Developer workstation. There, you can open it with any application you want, just by clicking. You can tag it for easy lookup later. There’s a 3-minute video if you’re interested in seeing what it looks like.